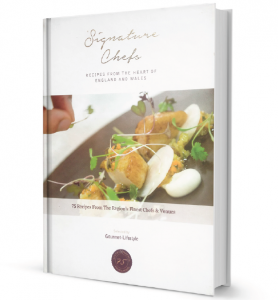 Signature Chefs Recipe Books SALE! 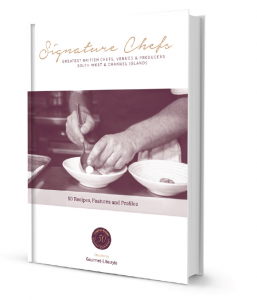 Celebrating the Greatest British chefs, venues and producers of the regions, Signature Chefs lifestyle books raise the bar in respect to quality British hospitality and supports British publishing. Each of book is printed and hand finished in England, supporting British publishing and offering the contributing chefs the opportunity to personalise their own covers. A first in the UK. Order featured books below and SAVE £5 each. Order all three to save £20! Ideal for Christmas presents. Containing over 200 pages of unique recipes with high quality, colour photography; as well as editorial contributions from renowned chefs from the regions. Great British Gourmet Experience Guide Features x 25 accredited Cookery Schools & contributions by Sir Terence Conran, Raymond Blanc OBE, Cyrus Todiwala OBE, Michael Caines MBE, Mark Hix MBE, Shaun Rankin, Richard Corrigan, Michel Roux Jnr, Jean Christophe Novelli to name a few. Supported by one and two Star Michelin Chefs. Exclusive Hotels Group, Chase Distillery, Wild Beer, Chapel Down Brandy & English Wines. Chefs recipes and exclusive insights. PLUS selected recipes for Chefs and cookery schools. RRP Just £15. SALE Price £10. Including donation to Charity. Taster page turner below. View ‘Full Screen’. ALL purchases entered into £1000 gourmet gift prize draw. SAVE £5 OFF EACH BOOK TODAY. Order ALL 3 & Save £20!